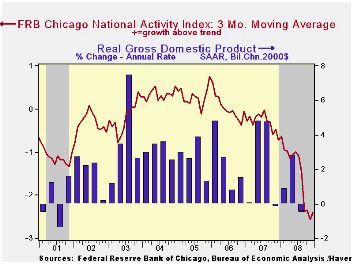 For December, the National Activity Index (CFNAI) from the Chicago Federal Reserve Bank continued lower into recession territory. The latest reading of -3.26 was near it's historic low. Since 1970 there has been a 75% correlation between the level of the index and the q/q change in real GDP. The three-month moving average of the index of -2.40 was at its lowest level since January of 1982. An index level at or below -0.70 typically has indicated negative U.S. economic growth. A zero value of the CFNAI indicates that the economy is expanding at its historical trend rate of growth of roughly 3%. Each category of the index including employment, production, income, consumption & housing made a negative contribution to the November index. In a separate survey, the Chicago Fed indicated that its Midwest manufacturing index fell during November to its lowest level since early 1997. The steel, machinery and resource sectors all were weak but the auto sector ticked up very slightly.